My garage is so crammed with "stuff" that there is only room to squeeze the car in on one side of the 2 car garage. I do have an excuse....well, I call it an excuse. I cleaned out the office last summer with some of the leftover furniture aka file cabinets etc being hauled into the garage and along with that "stuff" add to that more "stuff" leftover from the move of my sweetie from the Memory Care Facility to the Nursing Home. At the Memory Care facility he had a nice apartment style room with his own furniture, linens, art work on the walls, etc. In moving to the nursing home, none of that was needed. So between the office remodel and the switch in "care" facilities my garage took the brunt. When our "record breaking" winter took it's first stab at us way back in December, which by the way seems like ions ago, I felt it was time to make room for the 1 car in our 2 car garage so I pushed, piled, and shoved to make room for my Honda CRV. She needed to be out of that bad wind, snow and cold. I certainly didn't want her dying on me when I did find the courage to venture out. There is so little room that I have to turn sideways to walk between the "stuff" and the car. I can't tell you how many times I have brushed up against the winter dirty car which leaves winter crap all over my coat as I inch my way into the driver's seat. I mentioned that the snow is melting big time here, and instead of snow this week, we are getting rain instead. That is a good and bad thing. The bad thing is that it is adding more puddles of water to our already water-logged soil which in my world translates to more mud on my kids' paws, but the good news is I decided to leave my car outside for a free car wash. The thing is....due to the coziness (I love that word so much better than crammed full of stuff) I can't get my garbage bins out of the garage unless I back the car out to allow room...those are pretty big bins, wider than me so there is no way I can inch those bins out without first moving the car. And yesterday being garbage day, the car was moved outside. And ofcourse the car remained outside until Mr. Garbage Truck picked up my curbside garbage. This story is really getting exciting isn't it....garbage, just exactly what you all are dying to read about...snort. So being the ever lazy person that I have become as the years pass, I never went out to drive the car back into the "cozy" garage. I said above that "I decided to leave my car outside"....heck it was just pure laziness thru and thru that prevented me from returning the car to it's almost too tight spot in the garage. But as it turned out, leaving the car outside did indeed prove lazy worthy, she is clean again. All that winter crap has been washed away and down the proverbial drain. Oh and by the way....these pictures have absolutely nothing to do with the story I just told. Just figured after writing about crammed garages and garbage a little pretty might brighten up this post. Adorable story and I love that the photos don't go with the story. i like your dried roses. i need to park my vehicles outside next time it rains! I love the before and after roses. Our garage is also very tight - we park 2 cars inside (1 a van) and also the John Deere tractor. I squeeze myself between them to try and enter. I guess we are thankful that you didn't share photos of your 'cozy' garage! And, oh! 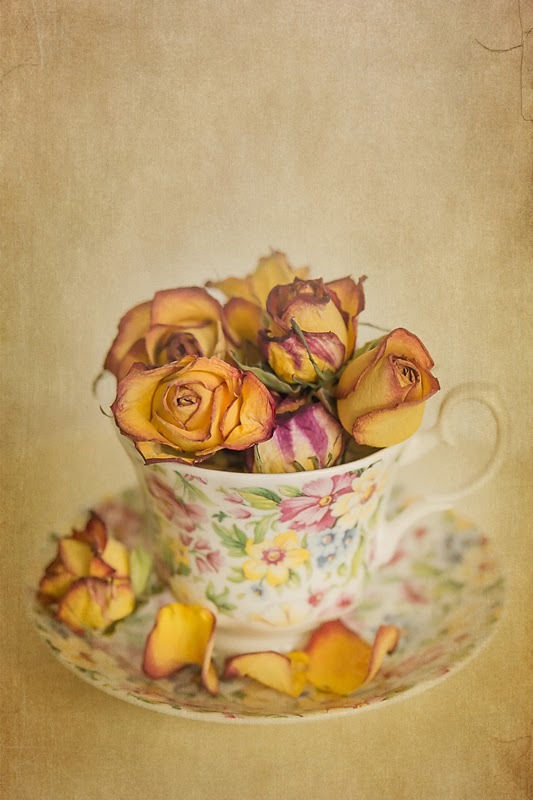 I do love these roses in the teacup. Lovely. Perfect. Brilliant! We have a one car garage... two cars (neither of which live in the garage right now) and have been de-cluttering & consolidating the "stuff" in our storage unit(s) (down to one now!)... still working on that garage! urgghh! I've been procrastinating about finishing the task! I can't squeeze between "stuff" NOR hop over "stuff" NOR do I have "foul weather" to prevent me from getting this taken care of. Basically, work (the paid kind! ), reading (the paper kind!) and skimming blogs (the electronic kind!) have been dominating my limited FREE time! I mentioned you on my blog today... so hope you pay me a visit?!!? LMAO!! I think winter has hit you hard Deanna! This post totally has me cracking me up! But the photos are gorgeous!!!! This really has me laughing, and so glad that you had the chance to get the free car wash! So hoping for spring blooms next week!!!! ROFL, from one who has been IN your garage, this just cracked me up! ;) Thankfully our garbage truck comes twice a week in case I forget and recycle on even another day. Love the photos, had some fun with tea cups myself in January on the front porch and if anyone saw me they might have thought I was trying out for a circus act. It involved stacking stools on top on another stool and tea cups on top of that to get the shot I wanted. Whew, nothing broke, haha! lol! Yep, I think it's time for spring! 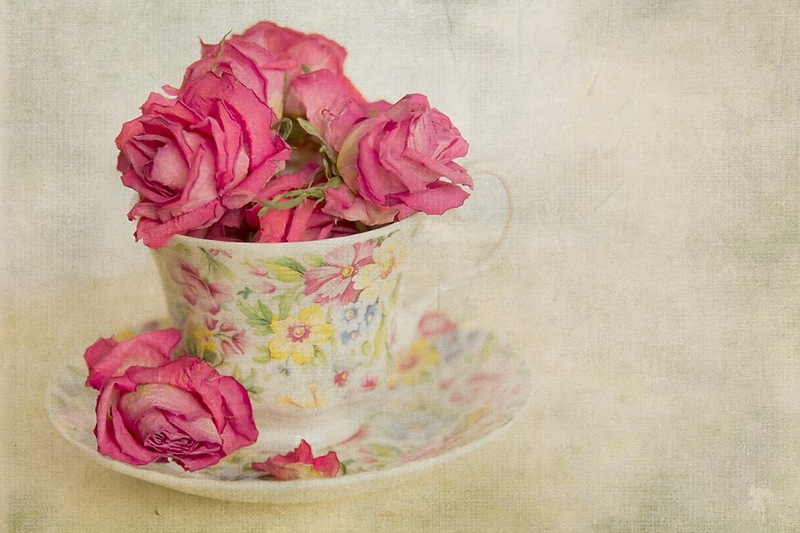 love your pretty little flower filled teacups! I think spring cleaning is a good thing and the rain did that for your car, now if only you could do that for the garage well maybe that is another story for another day. We are having much the same here, Deanna. I gave up on keeping the cars clean for right now. There is so much dust being kicked up from the leftover winter sand, that the minute they get washed, they are covered again. I hope you had a wonderful first day of spring. Not very spring-like here in NY. It is sooooooo cold. Garages are a blessing and a curse. I believe I've heard the logic of letting mother nature clean the car (husband AND son). We have no room in our extra-large double garage for either car. These images are so beautiful. I love your artful work. I'm laughing at your ramble. I have lots of "cozy" places in my attic, garage, shed... Sigh - I really need to do something about that. Thanks for the beautiful images to go with your story! I'm glad to hear I'm not the only one that has a garage full of crap that I can hardly get the car in. I can get the garbage can in and out though without backing out the car. That is so funny that you are writing about a crammed full garage.. That is what we are doing this weekend. Cleaning out my Moms crammed full garage. The garage was my Dads domain and my mom had no idea on even where to start to clean out.. So my two sister and me and our husbands are here to helper her out.. I have no idea what we will find but at least there is a lot of us to help. Your photos are so pretty my friend. I get it completely. I don't have a garage, but I brought lots of stuff home from my office when I retired last May, and a lot of it is in a corner of my bedroom. I am long overdue finding a place for things or getting rid of them and that's my project now. I'm home now and the clutter is getting to me. I keep thinking, "How did I ever accumulate so much junk?" Take good care and so enjoy your photos.